Hello – Jamie here! This weekend I visited my family in Massachusetts, where we spent the weekend by the water. When I was younger, my family and I would spend every summer near Cape Cod, MA. I think we can all agree that we didn’t appreciate our carefree summers enough when we were kids! At the time, I hated leaving my friends in Florida to spend the summer with my family (ugh!). I now look back upon it and really miss the days of doing nothing but laying by the beach and squeezing in a bit of those dreaded summer reading books. My family still spends their summers up north at the Wilkinson Beach House, so being in New York means I’m not too far away from them! This was my second trip there this summer to just relax, cook with my mom (our second favorite thing to do together, behind shopping, of course), and take in the beautiful surrounding nature. My last trip to the beach house was over Fourth of July weekend, a.k.a. when the house is filled to the brim with long time friends, home cooked food, and yes, a live band. This time around, we decided to venture away from the house to explore Cape Cod. I honestly don’t have too many memories exploring the Cape when I was younger because we always tried to avoid its terrible summer traffic. Instead, we spent most of our days at our lovely beachfront home or a day trip to Nantucket or Martha’s Vineyard. You could say that Cape Cod is The Hamptons of Massachusetts. No, there aren’t Revolve in The Hamptons-style parties, but it’s just as picturesque and just as big of a hype for the locals. Families usually travel to the Cape for a week-long vacation and tend to leave on Saturday afternoons – good for us, because we decided to venture onto the Cape at that time, meaning no traffic in our direction! My parents took us to their favorite lunch spot, the Wequassett Resort and Golf Club. The golf course and pool are for resort guests/members only, but anyone is welcome to roam the picturesque property and grab a bite to eat at the waterfront restaurant. When we went, it was a typical New England windy day, so the indoor-outdoor restaurant was covered to shield us from the rain. But, we could still SEA through to the pretty 360 degree waterfront view. The food was great and very accommodating to my food allergies – something I plan to post about later to explain more! It luckily stopped raining after lunch, so we walked around the property and I snapped a ton of pics, did you expect anything else?! The property is known for hosting weddings and other special events and it is definitely the right spot for it! There was no one by the pool that day because it was about 60 degrees out and very windy, but they made sure to have the hot tub and outdoor fire running. 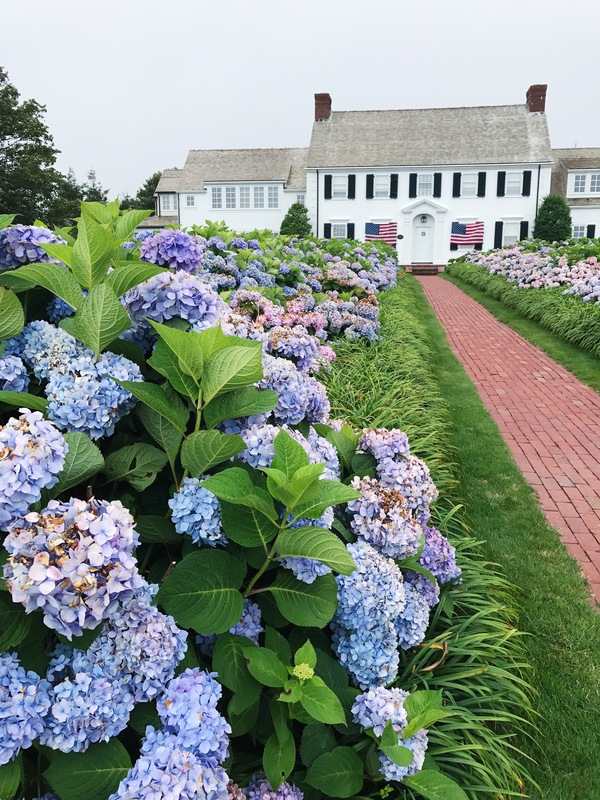 In my opinion, the best part about the property is its landscape design, which features a plethora of blooming hydrangeas – my absolute favorite flower! But can you blame me?! My apologies to whosever home this is, but kudos on your unreal hydrangeas – I don’t think I’ve seen anything prettier! We then drove to Brewster to check out a local beach walking spot called Crosby Lane. The wind was so strong that we didn’t stay for too long, but took note to come here another time on a sunnier day. The rest of the night, my mom and I tested some new baking recipes, like this Gluten Free & Vegan Butternut Oat Muffin! I got the recipe inspo from Minimalist Baker’s Vegan Pumpkin Muffins recipe and added my own twist to it. I plan to start writing more healthy baking recipes soon, so keep your eye out! I also spent some time catching up with my puppies, Buddy & Zoe. If you don’t already know 1. my obsession with dogs & 2. my obsession with my dogs, now you know. And yes, they have an Instagram account if you were wondering! We spent Sunday afternoon in Boston so that it would be easy for me to catch my evening flight back to New York. I visit Boston nearly every year, so I’m pretty familiar with all of the main sights (check out my Boston guide if you haven’t already), but one thing in particular that I hadn’t yet seen is the Isabella Stewart Gardner Museum. The origin of this museum is really interesting because it contains the art collection that Isabella Stewart Gardner personally travelled the world to purchase. Isabella Stewart was born in New York City in 1840 and later moved to Boston after marrying John Gardner, a native Bostonian. After gaining a large inheritance from her father, she made a huge mark in the art world with her extensive travels to collect each piece. The museum first opened in 1903 and Isabella’s personal living quarters were on the top floor. Today, the museum stands almost identical to her vision, which was one of the stipulations of her endowment. The museum is an amazing collection, with pieces from Venice, Medieval Europe, and Asia. It even features some artists like Michelangelo, Rembrandt, and Degas. It’s interesting to note that in 1990, 13 art pieces were stolen from the museum and have never been recovered! The museum also has a modern addition, where it houses changing exhibitions, like its current one, Listen Hear: The Art of Sound. The collection in itself is unlike any other, but I have to say that my favorite part was the gorgeous, luxurious courtyard. I can only imagine what it was like for her to wake up each day to this beautiful view. The courtyard garden changes nine times throughout the year according to the season, but I think that I caught it in its perfect summer bloom.